Customers browse your site and add items to the shopping cart. They confirm their payment and return to your website. You handle the sales. We handle everything from checkout, to security, to mobile compatibility. Start selling without the hassle. 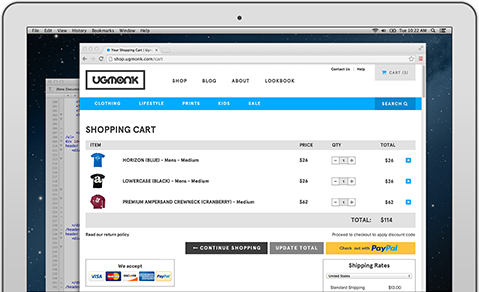 With Website Payments Standard, we handle the checkout and payment experience on our hosted pages before returning customers to your site. Customer using smartphones can complete their purchase quickly and easily. Website Payments Standard is automatically mobile-optimized, so there’s nothing more for you to do. Selling is as low as 3.4% + $0.30 USD per international payment, and no monthly fees or hidden fees. Get started quickly with our payment buttons. To integrate Website Payments Standard, just complete our form to generate your button, then copy and paste a few lines of html code onto your site. Whether you already have a shopping cart or are working with an eCommerce provider, our Website Payments Standard buttons should integrate seamlessly with their solution. Can I set up PayPal buttons myself or do I need a developer? Our Developer Centre provides useful information about our APIs, platform compatibility, set up guides and answers to other technical questions.